New York Painting Services is a full service painting contractor, providing professional services to the commercial and residential properties throughout the Greater New York and New Jersey communities. We are completely licensed and insured to provide our professional expertise at an affordable rate and with our experienced artisans perfecting their craft, your project will exalt in favorable outcomes. New York Painting Services exclusively utilizes premium quality products, materials, and equipment to ensure the superior execution. With our diligence in professional courtesy, friendly customer service, and traditional values along with our quality results; making every experience with New York Painting Services extraordinary. 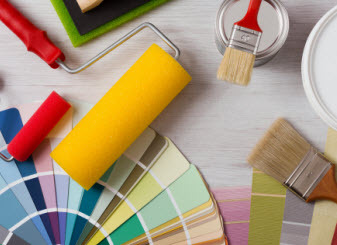 New York Painting Services offers a number of painting related services for New York and New Jersey homes and businesses in an effort to help clients get the color composition around them in the most effective manner. Painting with bright colors can be a challenge because too much can be hard on the eyes. Considering that most Americans in the 1800s only painted their walls white, the wealthy people were the only ones who indulged in colors, as colored paint was an expensive luxury. But modernly speaking, color is readily available and the multitude of schemes, people can bring any room to life. When people change the colors, the goal is to establish a new look and resisting the safe neutral palettes to add personality and flare to the space. Strong colors can be easily misused, as not all of them are stimulating to the senses. Finding contrast with balance can harmonize the strong colors; for example mahogany furnishings paired with deep forest-green walls well blend beautifully and still make people feel comfortable in the atmosphere. Neutral furniture is emphasized with the deep red walls that do more than add color; it controls the brightness of the surroundings. Consider when working with the bright colors, that the darker they are the more a room will recede. 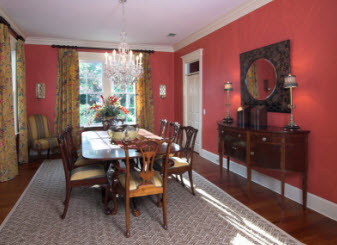 A large room will draw the walls in, so dark is a better color for trim or accents. Sunshiny-bright yellow can be tricky to not overpower a room. With the right applications of floral prints on the upholstery, curtains, or accessories, the bright yellow can be notched back a bit. When you opt to incorporate bright colors into your home, you do not have to commit to painting the walls intense shades throughout the room in one color, which would be too much. To create a theatrical backdrop for favorite pieces, for example, you paint the various colors found in furniture behind a wall of bookshelves. Whenever you have doubt concerning a color or colors, do not limit your perceptive to a small color chip. Instead, buy the smallest containers of the optimal colors and paint large pieces of cardboard to prop in the room. Be sure to pose it in different applications according to light, fixtures, windows, and so on to give you a better idea of how it will look. 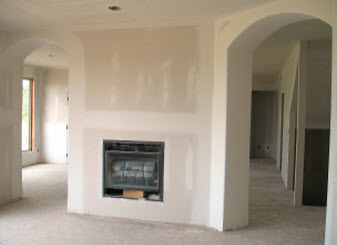 New York Painting Services, you can get the look you are looking for with crisp lean lines and smooth coverage. Call us today to get started!